As the days get longer and summer quickly approaches, we all tend to spend a lot of time outdoors. Whether we are playing with the kids, tending to plants or animals, mowing the lawn, or just relaxing, enjoying time outdoors is well deserved after a long cold winter. Time outdoors gets to be extended this time of year because of the later setting sun. 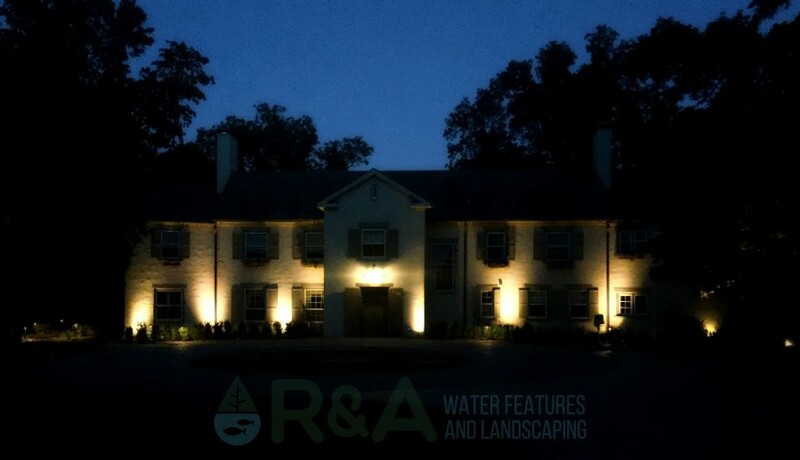 But don’t let your time outdoors be limited by the amount of daylight, your time outdoors can extend well into the night with landscape lighting. But does a landscape even need lighting, and how much does landscape lighting costs? You’ve got questions…we’ve got answers! Why Should A Landscape Have Lighting? Not only will landscape lighting extend your outdoor enjoyment time, but it also serves as a type of security. For perspective, lets imagine that you’re looking to break into a home (we know you’re not like that of course!). You come up to two residences where neither owner are home, one is completely dark outside, and the other has lighting on around the outside of the home, which home would you chose? Neither of course, but the home with the lighting can deter home invaders since they could easily be seen. Not only is landscape lighting a good security measure, but it’s also a good safety measure. Steps can be a tripping (or falling) hazard for nearly everyone. At some point or another we’ve all underestimated the height of a surface and had a little stumble, or worse a fall. Making sure your paths and steps are well lit for guests to see is important so there are no accidents, no matter how small or large they could be. 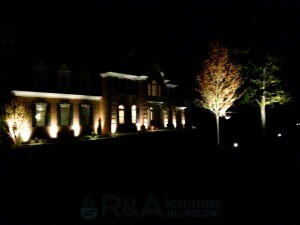 So now that you’ve decided landscape lighting is important for you to have, how much does landscape lighting cost? For the areas I want lit up, for security, safety, or purely for aesthetics, I have larger path lights installed, which light up a larger area and are brighter (but not blindingly bright like porch lights…more of a soft warm glow). The cost for the lighting we install is pretty affordable, and averages about $2,500 for a front foundation. Since many of the lighting fixtures we use, for landscapes and ponds, have LED bulbs, you can expect some savings on your energy compared to traditional incandescent lights. All in all, $2,500 spent on landscape lighting is well worth it to have that added sense of security and safety. And…the landscapes we design with lighting, well…they just look plain awesome at night, and highlight the beauty of your home and your new landscape. If you’re ready to add some lighting to your landscape or you’re looking for a landscape design make sure to contact us today. And be sure to check out our frequently asked questions for answers to your outdoor living needs.